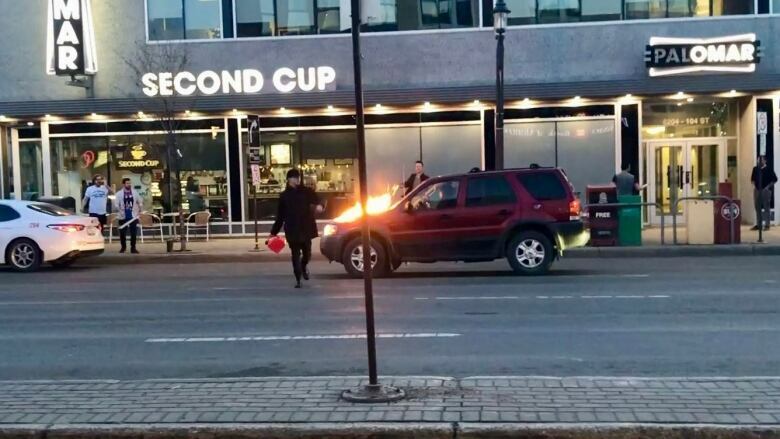 "It was kind of in a sarcastic tone," said Maxwell Putnam, a lawyer who was enjoying a latte inside the coffee shop on Whyte Avenue and Calgary Trail. It was around 8:40 p.m. Friday. Putnam was sitting near the front window as a man beside him showed off the new Batman comic book he'd just bought. He was being chased by three people, Putnam said — a moustached man in a Hawaiian shirt, a man carrying what appeared to be a 2x4 piece of wood, and another man recording the whole thing with a cellphone.